When people are in pain, they take medicines, right? An injection, syrup, or a pill to treat the ailment. In simple cases, any of these solutions would be enough to make us feel better. Only logging operations are far from simple cases. They are complex enterprises that require a lot of care, attention, and nurture to succeed. 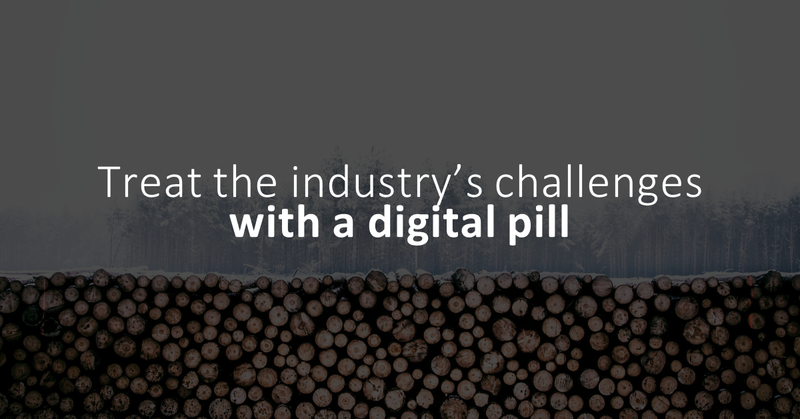 This blog gives you a digital pill, figuratively speaking, to treat some of the pain points that may afflict your own operations. The logging industry is a rather traditionalist one. Workers and staff tend to stick to tried and tested methods and tools, and there may be a reluctance to change, particularly across emerging markets. Technology may be part of the solution, but a bunch of computer chips is not a panacea either. Technology will only be as good as the people who use it or implement it. What would is a brand new laptop if it’s never taken out its box, for instance. Logging poses its own unique challenges and pitfalls. Here’s five of the most common ones, along with as many possible solutions. Safeguarding the safety of the cutting crews working out in the fields should be paramount. These men and women risk their lives daily to harvest the raw timber that supports your business. You need to protect the people working for you, be it cutting crews, contractors, or cleaning staff. The cutting crews would probably be more at risk, since they work in outdoor and inherently dangerous environments. The use of drones, for instance, may make all the difference between safety and harm’s way. Use drones to recon and survey the area to be harvested, to be aware of possible dangers such as damaged trees, extremely uneven terrain, sudden drops, etc. Use drone technology to map out the area and be prepared. Weather conditions can, and do change very rapidly in some areas of the world. Storm fronts may roll in quickly, catching crews out in the open. Storms may carry substantial electrical activity, which would pose a clear danger for those caught far from shelter. An integrated digital solution would provide timely and accurate warning in terms of weather reports, giving crews enough time to either move out of the area, or wait at base until the storm moved away. As explained above, traditionalism is a common issue among old-fashioned logging operations, which may have been operating in such environment for years, if not decades. Technology alone does not work, at any level. There needs to be an integrated solution between the technical and the human side. Human operators drive technology, not the other way around. Coaching, training, and learning development would need to be done on a gradual basis, to ensure staff learns ‘the new ways’ and adapts to them. This point ties with the one above. Your logging operation may have been interacting with clients in the same, traditional manner, for a long time. Your customers might be as reluctant to change as your own staff. The Microsoft Dynamics 365 package includes an integrated CRM solution, which you can use to your full advantage when managing your current customers, or acquiring new ones. The CRM platform can become the springboard for your logging operation’s future of dealing with customers in a novel and more efficient manner. Challenges to the success of a logging operation are many, and not all can be solved by technology alone. But technology does go a long way towards simplifying some of the issues faced by these enterprises. At the end of the day, success is a joint venture that depends on many factors, some of which unfortunately do not reside inside computer chips.